Welcome to the first lesson of Coffee Break French Season 3! In this episode listeners will meet American student Katie, Australian entrepreneur Veronica, and Alf who is a retired teacher from England. Our three characters are studying French at a language school in Nice, and in each episode you’ll hear an extract from their diaries, recounting their adventures on the French Riviera. We’ll pick up on a couple of language points in each lesson to help listeners understand the content. 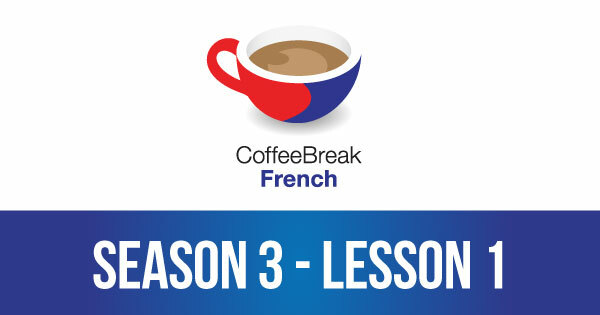 Please note that lesson 01 of Season 3 was originally known as lesson 301 of Coffee Break French. We have renumbered the lessons of each season as lessons 1-40 to make things more simple for our listeners. Hi! First of all, thanks for the new season of CBF! I’ve just listened the first lesson, so I feel like it’s going to be a lot of interesting language information in this season. Waiting for the next one! I really enjoyed the first episode of Level 3 of Coffee Break French. I’m looking forward to future episodes. Thank you for continuing with Coffee Break French! Season 1 and 2 were perfect review sessions for my recent trip to Paris. I can’t wait for Season 3 to continue my language learning. The first episode was great! Mark, I am very impressed with Season 3 so far. I started listening to CBF in 2008. Having exclusively native speakers for Season 3 is a super idea. Also, the interesting dialogs of Season 3 sound great. We’re delighted you’re all happy with our return and the content of the new season! I realy happy with the return of your french lessons! I’m waiting hopeful for the next! So far, Season 3 exceeds expectations! Thank you. One glitch for me. I have downloaded both the pdf and ePub versions to my iPod Touch. I like the ePub better, but for those of us with older eyes, the font (even the larger one) is too small, and the two finger swipe to enlarge does not work. Help! oooh, I am so happy to hear coffee break french again !!!! I`m a german physiotherapist working in luxemburg and I need so much more knowledge in foreign languages, and its so wonderfull to ingrease my english and french in one podcast!!!! I have just loaded the epub versions of CBF 301 to 305 into my ebook reader. Just what I’ve need waiting for. As I am now doing the Spanish Course and oftern go back over CBF’s early lesson. I would be great if you could go back and publish in epub form. I’d willingly pay a supplement. Sorry but im totally confused. My husband and I have followed all 80 of your coffee break french programmes and just love them but no matter where I look I cant seem to find the free downloads of season 3. We planned to listen to them and then maybe buy into them but definitely buy into season 4 but they seem impossible to find. I have tried searching cbf lessons 301, season 3 lessons 1-10, anything but they remain resolutely hidden!Help!